If your windows feel drafty, energy efficient window treatment like thermal Roman shades, are a quick decor fix that can seriously reduce your heating costs. What are they exactly? They're like quilts for your windows that block cold drafts. If you have sewing skills, you can purchase a Roman shade kit. Including the fabric, each window treatment will cost around $50 to make. 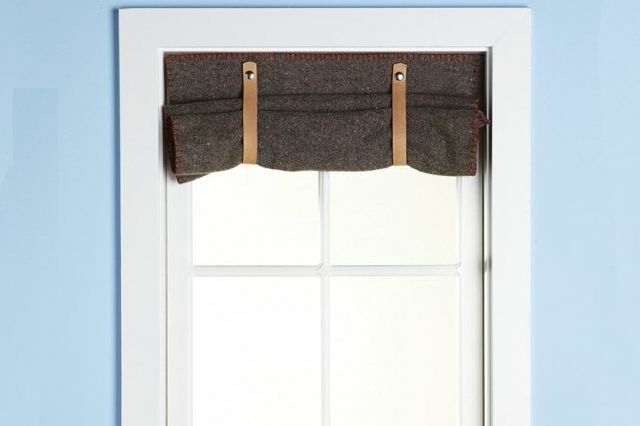 You can also warm up winter windows with DIY wool curtains. In case you're not in the know, wool is a highly efficient insulating material. The cool rustic curtain above was made using a wool military blanket. You can find bedding like this on Amazon for around $30 each. If you prefer to buy, look for curtains that come with detachable thermal panels. Window treatments like these tend to provide better insulation. Walmart has an affordable selection that starts at $15 per panel. Tip: You can warm up a room using a ceiling fan. Warm air has a habit of floating up to the ceiling, which can make a room feel chilly. Operating a the fan in the reverse direction, will push it back down.